I have been blessed to this week as I have listened to people's stories (numerous stories) about the role Ridge Church is playing in their lives. I'm blessed by those of you that give sacrificially and consistently of your time and pay checks because you believe that "all people really do matter to God!" I am blessed by the creativity, hearts, skills, and passion of my staff and consider it an honor to work along side them. I'm blessed as I reflect on what a great mother, and wife to a crazy, dreaming pastor my wife is. I'm blessed that one of my children prayed recently asking Jesus to be their Savior! I'm blessed by my four prayer partners that in-convenienced themselves in a major way this week to beg God to show favor on Ridge--so that we can bless the people of this city. Blessings are always followed by a comma NOT a period. We are blessed, because God intends for us to bless others. Each blessing is an opportunity to bless others. Now, I know some of you reading this are currently in the midst--wrestling with some difficult situations, relationships, heart aches, losses---and just maybe you wouldn't define your life as "blessed". I get that--I understand it, but I suspect that if we could see our lives in respect to the atrocities and misfortune of the world around--if we all could simply realize that every inhale and exhale, every thought, every meal, simply having a place to lay our head...that every moment or act demonstrating love are all blessings. If we could just recognize that blessings aren't always in the form of accumulated wealth and more stuff...maybe we 'd realize we are in reality blessed?---If we realized that WE'RE ALL enjoying privileges and amenities that many will never enjoy---just maybe we would re-define what a blessing really is. In Jeremiah 1:5 God says to Jeremiah, and it is true of us too, "Before I formed you in the womb I knew you, and set you apart..."---- Restated, God formed you, and even before he did that, he had a plan for you. A purpose, that all of your days on this ball of dirt were intended to work toward accomplishing...GOD, the Creator--FORMED you, has PLANS for you, and on top of that he BLESSED you. If that is true...and I believe it is, what are the practical implications of that as you move in to tomorrow and the next day and the next week??? It's staggering, inspiring, motivating!!! 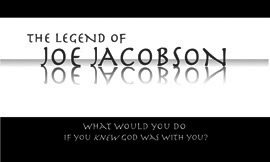 Again, I can't wait to begin this new series this Sunday, "The Legend of Joe Jacobson." The interest and intrigue are high---with people wondering and asking, who is this Joe Jacobson character anyway. Well, come and find out. 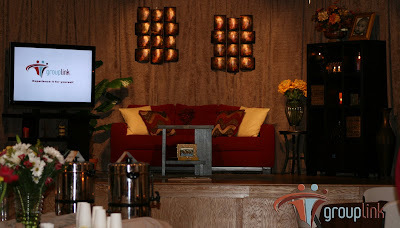 I will also reveal more about the new website ifiknewgodwaswithme.com this weekend. We have many hits coming in to the site already already...wondering what it's about aren't you? Incredibly powerful and practical series. Don't miss it. This we ekend was our first time skiing in probably 6-7 years. All three of my children were hitting the slopes for the first time. The pictures to left and right are me (a little bit rusty, but you can tell I've still got it--kind of sore today, though:-). The one in the middle of the slopes face down is my wife...okay, okay, it's a stock photo (I live with her--it wouldn't have gone well if I didn't fess up!) Plus in reality--she is a much better skier than me. So, the kids all went to "ski school" which was almost a complete waste of time. I say almost, because the one very good thing they learned was "How to get up when they fall". Something, by the way, that most Christians never learn very well in their relationship with God--churches aren't great at teaching this either! Learning to get up is a very important part of the journey! So, I was in charge of teaching Brayden to ski (after ski school? ), and it was literally exhausting for me. Not physically, although "I ain't as good as I once was..." but it was exhausting emotionally because I wasn't a very good ski instructor. I was somewhat impatient. You've had them...aha moments where something clicks. Usually it is very simple--- I was behind Brayden as we rode up to the top of the "Bunny Slope" and was explaining how skiing wasn't a natural motion (We saw numerous awkward wipe outs from people to confirm that theory). I told him that we have to teach our mind and body what to think and do and then practice it over and over until one day we do it with out thinking...but it takes tons of practice. Short and sweet (Aha! )...Paul, an early follower of Jesus, said the same thing about our spiritual life and following Jesus. If you are new in your relationship to God, or coming back after a while away, or maybe you've just never been taught---THIS IS HUGE. Growing in your relationship with Jesus takes practice and work--it isn't automatic. At first it feels un-natural. You have to teach your mind and body what to think and do and do it over and over again. In 1 Timothy 4:7 Paul says we must "...train ourselves up for godliness." That word train (Gumnazo) is the word we get our word gymnasium from. It means "to exercise vigorously either the mind or the body." In other words, it may not feel natural or easy, and will require the engagement of our thoughts and actions. Going to the next level will require more than simply listening or participating in Sunday church. BUT, THE RESULT IS WORTH THE EFFORT! There's nothing like drawing close to God in a personal way. By the end of the day all three of my children were skiing from the mountain top down one of the blue squares, like little pros! (Angie, took over teaching Brayden and did much better). They didn't necessarily enjoy ski school (Gumnazo) but they loved the slopes! I know our experience with Jesus will be that and much more--so get to the gym and start training! I promise this isn't a motivational speech, about how "...the winds of change are stirring in your soul--you simply need to release them--blah, blah, blah..." However, a little diagnostic test on each of our attitudes is in order from time to time. "Leadership has less to do with position than it does with disposition. The disposition of a leader is important because it will influence the way the followers think and feel. Great leaders (which I'm assuming most of you want to be!!) 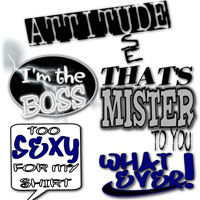 understand that the right attitude will set the right atomsphere, which enables the right response from others." If you are generally negative, always have a problem that needs to be addressed, always feel like someone else has it better than you, or feel like people are always out to get you...chances are good that no-one really likes being around you, let alone being led by you! On the other hand consider the leaders you love being around--I'd be willing to bet that they are positive, and encouraging about life's possibilities. Positive people are better leaders! How is my attitude affecting my team/co-workers? How is my attitude affecting my employees/volunteers? How is my attitude affecting my job performance? How is my attitude affecting my marriage/family? Okay maybe the $20 gift card needs to be to auto zone to pick up a new wiper blade for the owner? (picture not taken by the owner by the way)...but we do have a winner! Gift card will go in the mail. 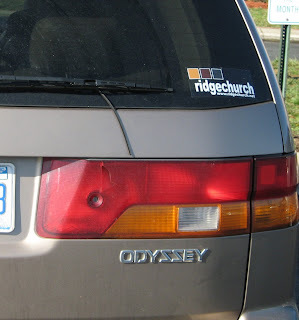 If you want to be a part of the Ridge Church epedimic and help spread the word, contact us here, and we will send you a decal. Be sure to give us your mailing address. Ridge Church met for almost a year as we developed a core team of people that fully embrace the mission and vision of this church. 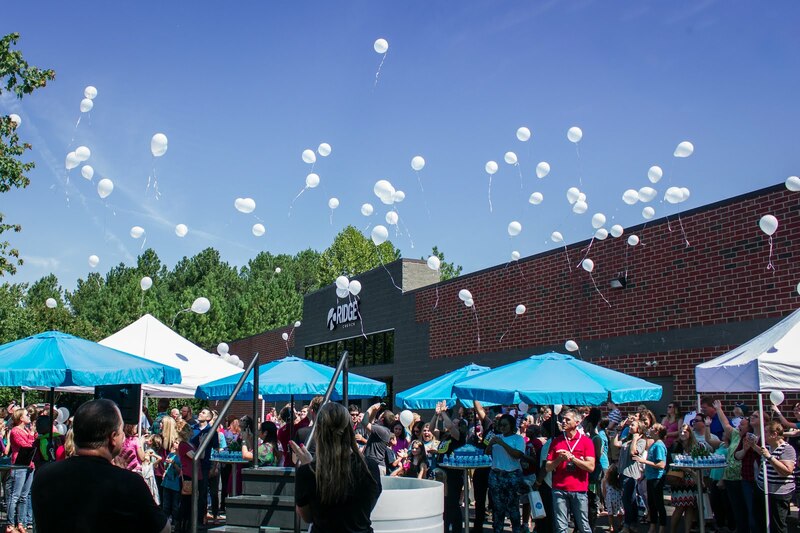 Then just a few months ago we launched this church publicly...kind of like a grand opening. 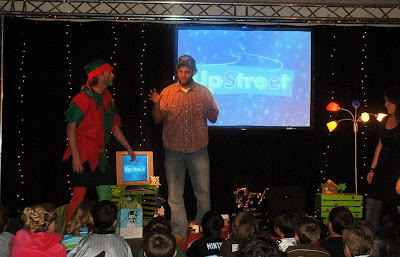 That last picture is "Upstreet" our environment for children K-5th grade. It's really unbelievable! It is so engaging for children. They are bringing their parents back to church each week. 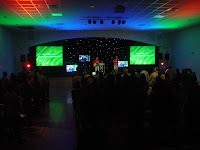 We are excited and ready to make the move from Sunday nights to Sunday mornings. 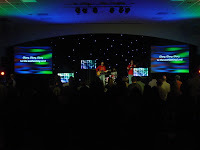 We have watched the church grow from a core team about 45-50 people to 175+ in just 16 services [meeting at night! ], and we can't wait to see what happens when we move to a Sunday morning meeting time...we know it will be a much easier invite for families with small children! You can help us get there. I am asking 45 individuals or families to step up and commit to becoming percentage income givers at Ridge Church so we can make an offer on an A.M. facility. 22 different families and individuals have stepped up with commitments already. Click here to sign up as a Vision Partner for this exciting new movement called Ridge Church. We are looking at three facilities currently. Two are waiting on an offer from us!! These are exciting days. We will see these days in the rear view mirror soon and realize how significant and life altering our commitments and sacrifices really were. I know God intends for us to bless this city. Waiting to hear from you!!! Part 2 of Louie's series "Indesribable" (catch up on part one here), was really powerful--maybe even a bit overwhelming! I have heard from several people already today talking about the contagious atmosphere of the night. Josh Via and the band were amazing! 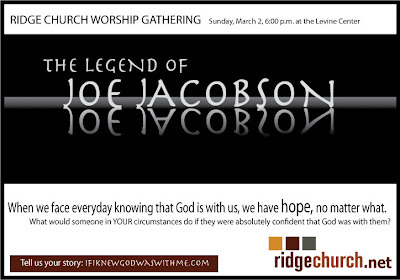 March 2nd, we begin again with "The Legend of Joe Jacobson." I promise, you won't be able to get the concepts and principles of this series out of your head for weeks. Seth Godin, at google said something in a recent talk that applies to us. It should be obvious but was interesting to me. It went like this, "[Remarkable] doesn't mean beautiful or ideal or perfect. It only means one thing. Worth making a remark about." It seems to me that if Ridge Church would simply be "remarkable", we would go a long way toward partnering with each of you to see the people that you know and love, experience the love of Jesus. Based on what I heard from you in the foyer last night, various conversations, and your emails today, it was a "remarkable night." We look forward to many more of those. Keep spreading the word. Throw out a little competition and the place goes wild. The most impressive thing to me is your "creativity and innovation" when it comes to bending the rules. Here is the first picture (taken from a moving car?). I am sending a consolation prize, but the contest is still on. 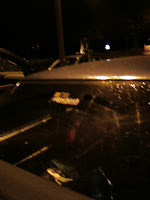 This sticker was on a staff car...new rule we introduced last night---No Staff Cars! I don't want you guys tailing us like paparazzi. I've seen the celebrity melt downs. Not Good! Still need a decal? Click Here and we will send one. Be sure to give us a mailing address in the message box. **I will give an update on Facility and Ridge Vision Partners tomorrow. Yesterday, I got in my truck and said out loud "Thankyou, God for windshield wipers," then I got cracked up thinking about how it could have looked--me talking to myself? to God? about windshield wipers. (If you've ever seen anyone in the car by themselves talking to themselves, or singing out with passion, you know why I was laughing at myself) I was that guy for a moment. I figured my windshield wipers were done for--money waiting to be spent---you know the feeling:-) But Rusty (our service program director at Ridge) popped in a new fuse and I was good to go. So last night and again this morning...I had a new context for the small but significant blessing of functioning windshield wipers. Trust me...you don't even know how much more relaxed you are on your rainy day commute because of this little invention. Got me thinking...Are you up for a contest? Well, this reference to my Ridge decal along with two other conversations this week about people spotting Ridge car decals around town got me thinking. I think a little contest is in order. Ridge Church is just starting to be a recognizable name in the community which is a lot of fun. **Please, drive safely you camera phone, radicals!! If you'd like a Ridge decal click here, fill out the form and we will mail you one--be sure to put your mailing address. I'll post the pics on my blog as I receive them. You've thought it when you passed the guy or girl driving the car of your dreams, "I deserve that." (for me it's a four door jeep---it's not personal but I don't like you if you have one:-) Or to quote Alanis Morissett in her song Ironic "It's when you meet the man of your dreams and then you meet his beautiful wife"... you think "I deserve that." (I dated myself with that one) It's when the person at work gets the job promotion and you kn ow they cut corners you think "I deserve that." The problem comes in when we begin to expect something from God that he never promised. It happened to the hired workers in Matthew 20. They were upset when the people that worked less time got paid an equal amount of money. "That's not fair...we deserve more", they complained. Jesus response was simple and direct. I gave you what I promised. Essentially they were upset that he didn't provide something he never promised. If I was God (and we are all glad I'm not) that would be totally frustrating! So drill down in your own life. Just one moment of brutal honesty. If you are frustrated with God, disillusioned, given up on church, feeling He has been unfair in some arena of your life...here is the question you need to wrestle with. Are you mad, frustrated, disillusioned over something God never promised? It's a valid and possibly freeing question, if answered honestly. False entitlement is a dangerous and infectious disease. "I deserve...is a dangerous path to allow your thoughts to follow." Just a thought. Hope to see you this weekend at Ridge Church. Do the next right thing! Here's a simple thought. Today in your office, at your school, in your marriage, with your finances, in that business deal, in your relationship to God, with your kids, just focus on doing the next right thing. Some where along the way, when you string together a few "next right things" it results in a very different life--and I know most people long for that secretly if not openly. But for now, just stay focused on doing the next right thing. T his is one of the challenges a group of us extend to one another each Thursday morning as we meet. Every team needs a scoreboard, a way to keep score that identifies "when we are winning"...even our children wonder, "Did I do good, daddy?" As long as the "win" is unclear, you force your team to guess what a win looks like. Do you (or those that work for you) know when you have been successful? If the win is unclear, you may force those in leadership roles to define winning in their own terms (NOT GOOD!) --- produces turf wars, sideways energy, very little traction and very little if any forward momentum. My favorite--(this is important if you are the boss, owner, pastor, or even if you have people that work for you in some capacity)...As long as people are winning they will give you, their time, their money, and their hearts. IT'S JUST TRUE! **"When people (organizations) are winning and they know it, they work harder, are less negative, trust the leadership more, give more generously, and stay involved" (pg 77) Wouldn't you like to lead or work in an organization where people possessed those qualities? Clarify the win for your team (whatever that team may be). Tell someone about Ridge Church this week. Help us spread the word about this exciting new church. Our new series "Indescribable" by Louie Gigilio begins, Sunday. It's a privilege to work with talented people and I have a team full of them! In addition to my staff team at Ridge Church, I also have the unique privilege of being married to a phenom of creativity and a natural leader. Every time my wife rolls out one of those unbelievable and way over the top themed kid's birthday party's (had a Barbie look alike at one party)---she always gets requests to plan the parties o f others. I married up---hope you did! So my wife, our groups director Adam Ponder, and superstar volunteer, Marla Baswell led the charge to plan, create, organize, and unveil our first Group Link at Ridge Church. All of our staff and many other volunteers also pitched in to make this night an overwhelming success. We successfully connected around 65 adults in this first group link and can't wait to hear the incredible stories that will emerge in the days ahead...and we know they will. Ridge Church is truly an exciting group to be a part of right now. You can sense the energy and excitement from the parking lot, to the hallways, to the children and adult worship environments. We keep hearing stories from many of you describing peoples' excitement about Ridge. Thanks for sharing. The next piece of the puzzle and logical next step is making the move to become a "Sunday Morning Church." Many of you have stepped up and committed to place your shoulders under this church financially to help us move successfully to Sunday morning. 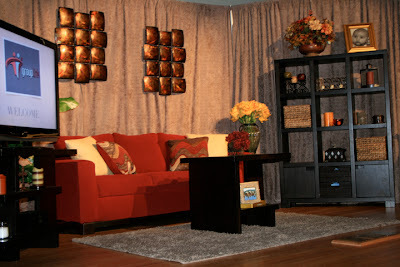 We want to make this move while maintaining the high level of excellence that is the standard at Ridge Church. In short, we are asking 45 families, or individuals to commit to become percentage givers to help us get there. I will continue updates of our progress on my blog. Thanks for being a part of this un believable opportunity to make a difference in the lives of people across Charlotte. Keep spreading the word about Ridge...and thanks for responding so generously to the VISION! In no particular order here are a few things I'm learning, a few people I'm learning from, and...well...other important stuff! The question we (church and church leaders) must ask is, " What are we doing for the sake of a generation that we don't want to lose?" "Alignment" (in an organization, team, church, family etc) doesn't just happen by doing nothing. "Misalignment" happens by doing nothing. Alignment is always intentional. Be it right or wrong--Relationship often trumps mission. People want to know "who is coming?" more frequently than "What it is about? (regardless of what "it" is) You might have to think about this one for awhile! I know, I know...it sounds like speed dating or fraternity/sorority rush...but it's an incredible experience. Last weekend, I went on a retreat with my community group and it was such a great time. Three months ago most of them didn't even know each other, but now we are close. People look forward to the nights that we meet. We pray for each other, study God's word together and we laugh a lot and have loads of fun together We also take time to just exhale from life's craziness. We are figuring out what it looks like to "do life together". Without question, it's the best thing we do as a church. C heck it out February 2, 7-9pm at the Levine Center in Matthews.